The DoMor Equipment Super Duty (SD) Land Rake is the newest addition to the skid steer lineup. The SD Land Rake is designed to tackle multiple jobs with ease, from prepping trails & food plots, to removing vegetation, to breaking up clods, the SD Land Rake is the perfect attachment to get the job done quickly. 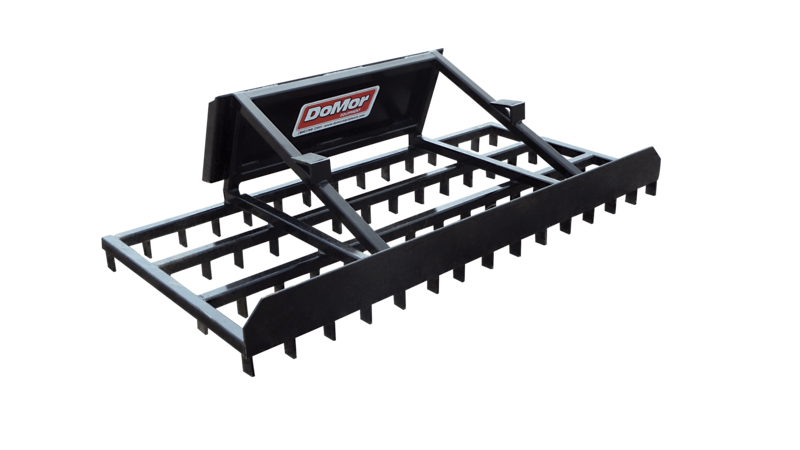 Created with 1/4″ steel and using the existing rugged DoMor quick attach plate, the SD Land Rake is built for years of use. Available in 6′ or 7′ widths. 2″ Tubular Steel Frame: Ensures the SD Land Rake will hold up for years to come. 3/8″ Thick Front Push Plate: Adds to the ruggedness and stability of the rake. 4 Full Rows of Staggered Tines: Each tine is 3 1⁄2″ long, 2″wide and 1/2″ thick, makes clearing simple. 6′ Land Rake 470 lbs. 72 in. 24 in. 44 in. 7′ Land Rake 490 lbs. 84 in. 24 in. 44 in.